The Society of Christian Doctrine, known as M.U.S.E.U.M. was founded in Malta in 1907 by St George Preca and it forms part of the Universal Catholic Church. The apostolate consists of evangelisation of children, youth and adults to glorify God. It was approved canonically in Malta in 1932. The main two objectives are personal sanctification by means of a personal relationship with God and evangelisation by word of mouth and by role-modelling. M.U.S.E.U.M. is the acronym of the motto of the Society: Magister Utinam Sequatur Evangelium Universus Mundus: May the whole world follow the Gospel. Evangelisation is the main apostale of the Society. However, no one can give from what he/she does not possess. Thus, the Society strives to keep the members updated with the Church teachings in order to be a resource of knowledge. This is done by self-directed learning and community learning through the daily Assignment which is normally held in the local centres. There are 52 Museum Centres in the parishes of Malta (n=45) and Gozo (n=7) where catechesis is delivered to children in preparation for the first Holy Communion and the Holy Confirmation. Christian education, enhanced by the use of audio-visual aids, is delivered also to adolescents and youth who attend regularly. Additionally, the Society organises special weeks for adults in various parishes, during which catechesis is delivered daily. The various religious and non-religious activities, including the recreational social activities contribute towards the formation of the youth by integrating Christian values in life. To enhance the spirituality of the members monthly day retreats are held at the local Centres whilst weekend retreats are held on a central basis. The meetings are held in the individual local centres and also on national and regional bases. The Female Section was established in Gozo in 1915 after the personal intervention of the Founder. In Gozo it started twenty six years before the Male Section. The first member was Rakela Camilleri who kept corresponding with the Founder up to his death. The Centres are open everyday in the afternoon from about 4.30 p.m. onwards, including Sunday morning from approximately 10.00 a.m. onwards. General and district meetings are also held by the two main Committees which take care of the youth Christian formation. By mail: Dar Dun Ġorġ, 31 Nazzareno Street, Marsa HMR 2253. Dar Dun Ġorġ, 31 Nazzareno Street, Marsa HMR 2253. 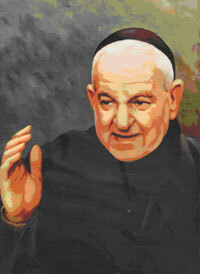 Saint George Preca (1880-1962) who was canonized in Rome on the 3rd June 2007 by Pope Benedict XVI.